Abundant resources of ocean, mountain and forest, and a diverse mix of different communities, have formed the extraordinarily vibrant and multifaceted character of art and culture in Kaohsiung. Walk along this city’s streets or through its subway stations, and everywhere you can see the elegance and beauty of its public infrastructure, street furniture, public art and urban architecture. The concept of urban development is based on concern for humanity and the pursuit of aesthetic values. This is most clearly manifested in the design of the bridges that link Kaohsiung’s people together. On the lower reaches of the 12-kilometer-long Love River, Jhongjheng Bridge and Kaohsiung Bridge bind together the riverside parks to create local people’s favorite waterfront area. On the river’s middle reaches, the heart-shaped lakes and curving bridges of the “Heart of Love River” elegantly trace out the lines of the city; the project won a FIABCI Prix d’Excellence Award in 2009. But the river’s most radiant high note is the Bridge of Light in Riverside Park, one of the locations where director Tsai Ming-liang shot his movie The Wayward Cloud. Then there is Rueiyuan Bridge on the Singfuchuan canal, full of a sense of the rhythm of the waves; the simple, clean beauty of Yicyun Bridge on the Houjin River; the scenic Sinwei Bridge; and the single-tower cable-stayed bridge that carries the Second Freeway over the Gaoping River. This arresting structure stands like a rainbow, or a butterfly stretching its wings, full of power and beauty. Kaohsiung also displays a unique urban aesthetic in the area of public transportation. The innovative shared poles for traffic lights and streetlamps stretch their wings like seagulls, bringing a fresh and striking atmosphere to the streets both and day and night, and illuminating the city’s dreams. 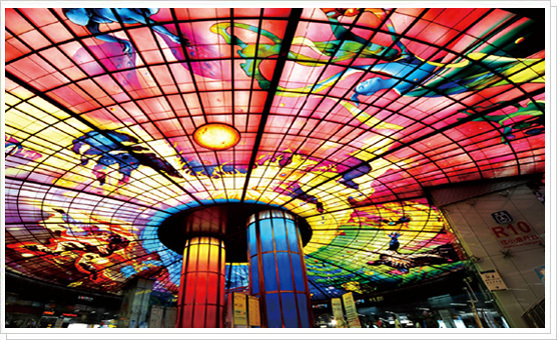 And the unique designs of the Kaohsiung MRT stations, along with the city’s public art works, turn the urban space into an art gallery. 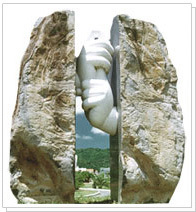 For example, at Formosa Boulevard station, the aboveground station structure, designed by Japanese architect Shin Takamatsu, is shaped like hands clasped in prayer; while in the station concourse the “Dome of Light” created by Italian artist Narcissus Quagliata is the world’s largest public art work made of glass. Both are moving and awe-inspiring works. After over ten years of effort, Kaohsiung City has achieved a great deal in the hardware construction area. The achievement in software construction parallels this because the hard work in the planting of cultural seeds has turned a desert into an oasis. There are over 380,000 students at present, which account for 26.71% of the total population of the city, among which there are over 23,000 college students, accounting for 3.78% of the college students in our country. In addition to National Sun Yat-Sen University, which nurtures top elites in science, marine science and business and management, National Kaohsiung Normal University also takes up the responsibility of training teachers, whereas Kaohsiung Medical University fosters excellent medical professionals for Southern Taiwan. More importantly, new universities are being integrated in the coming years, such as a business technical college, National University of Kaohsiung and Kaohsiung Catering Management College. Existing universities will also be extended and evening courses will be provided; therefore, the education system of Kaohsiung will be enlarged and there will be more opportunities to receive a university education. Regarding cultural construction, Kaohsiung Chiang Kai-Shek Cultural Center possesses a large theater (Chih-Teh Hall), a small theater (Chih-Shan Hall), a library, a cultural corridor, exhibition room(s) and meeting room(s), etc., in which different cultural activities and art performances such as Chinese operas, local dramas and symphony performances are held throughout the year. Since the opening of Kaohsiung Museum of Fine Arts which is situated in Neiweipi Cultural Park in June 1994, it has become an important area for art in Southern Taiwan. The Ministry of Education has also agreed to set up the National Taiwan Arts Education Center in the Cultural Park. The large National Science and Technology Museum, Kaohsiung Museum of History, Kaohsiung City Music Hall and Kaohsiung Business Exhibition Center will all together give Kaohsiung, which was engaged in heavy industry in the early days, a feel of artistic romance.